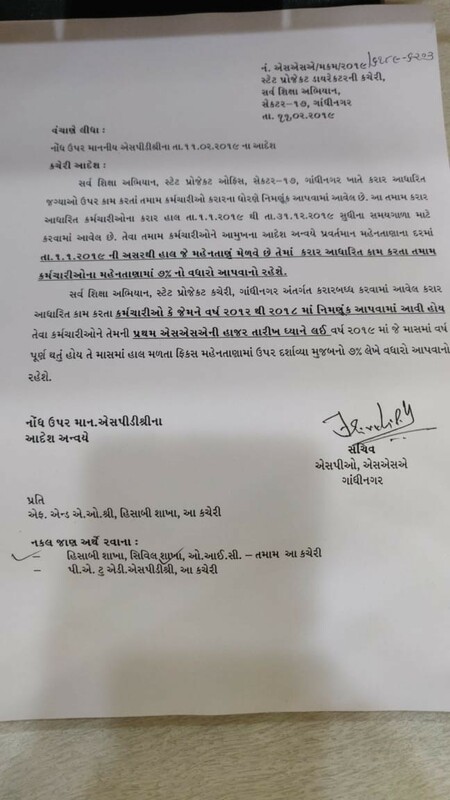 GOOD NEWS :- SSA NA KARAR ADHARIT KARMACHARIO NA MAHENATANA MA 7% NO VADHARO KARVA BABAT SSA NO LATEST PARIPATRA. AapnuGjarat Give Gujarat & India Level all type of new jobs information.Here you can Get Various job Like Graduate jobs,Engineerjobs,Diploma candidate jobs,Mbajobs,Law jobs and other various jobs.Aapnu Gujarat is famous for competitive exam’s preparation. we provide complete exam materials for various exam Like Tet,Htat,Tat,policeexam,Clerk exam, GpscExam,panchayat clerk exam and other Gujarat Level Exams.